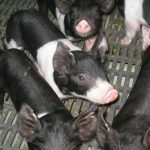 The UW-Extension Swine Team, in conjunction with Wisconsin Pork Association, hosted a webinar for veterinarians who are interested in more details on Wisconsin’s new animal health rule that establishes herd testing requirements for Porcine Reproductive and Respiratory Syndrome (PRRS) and Porcine Epidemic Diarrhea Virus (PEDv) in Wisconsin. Paul McGraw, DVM, Wisconsin Department of Agriculture provided details on the rule, including testing requirements prior to movement and how to complete a herd plan for farms that are positive, or who bring pigs into the state that are untested. Tammy Vaassen from the Wisconsin Pork Association provided details on submission of samples and where to find additional resources. You can view the recorded webinar below or directly in YouTube.